Easy to swallow. Full Spectrum Chaga by Planetary Herbals was recommended to me by my Natural Health Coach to boost my immune system. This item has so many benefits like; anti-bacterial,anti-fungal,anti-anxiety,probiotic,etc. 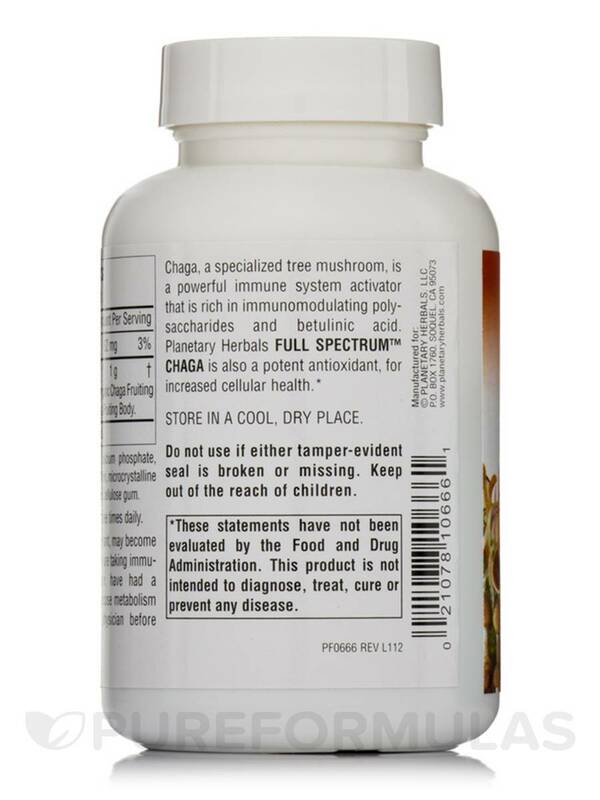 Full Spectrum™ Chaga 1000 mg 60 Tablets from Planetary Herbals might boost the immune system and provide antioxidant support at a cellular level. The chaga is a type of mushroom that is found on some varieties of birch trees. This mushroom has been popular among Chinese‚ Russian‚ European‚ and North American people for its medicinal properties. The immune system plays an important role in keeping the body healthy and we should in turn provide it with some external support to keep it working efficiently. This is where a supplement like this one from Planetary Herbals might come in handy. 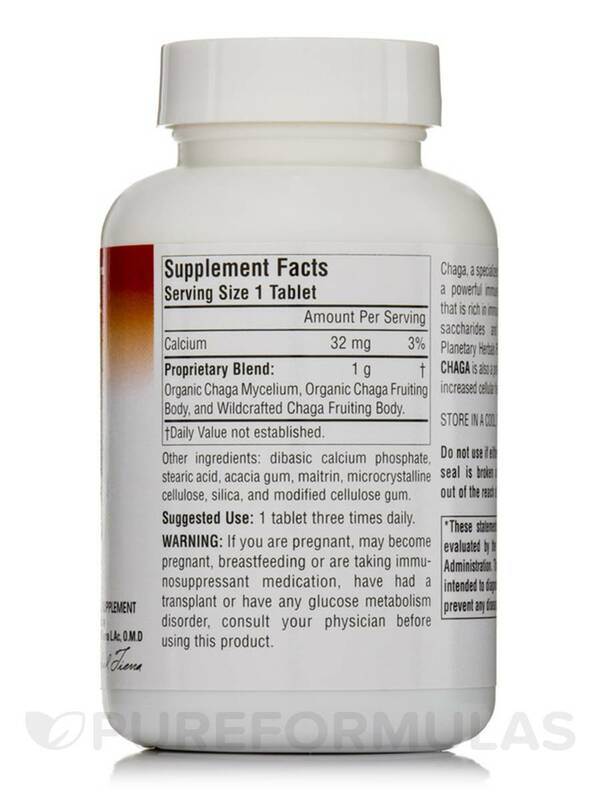 The chaga mushrooms used in Full Spectrum™ Chaga 1000 mg 60 Tablets from Planetary Herbals are rich in polysaccharides that could support the immune system and provide antioxidant support to the cells. Antioxidants are known to promote cell health by preventing or stopping any damage caused by mutant molecules called free radicals. The supplement contains a wide variety of nutrients including saponins‚ vitamins‚ flavonoids‚ and minerals‚ which make it a very potent compound. Full Spectrum™ Chaga 1000 mg 60 Tablets from Planetary Herbals may also have anti-inflammatory and pain relieving properties. Organic Chaga Mycelium‚ Organic Chaga Fruiting Body‚ and Wildcrafted Chaga Fruiting Body. Dibasic calcium phosphate‚ stearic acid‚ acacia gum‚ maltrin‚ microcrystalline cellulose‚ silica‚ and modified cellulose gum. If you are pregnant‚ may become pregnant‚ breastfeeding or are taking immunosuppressant medication‚ have had a transplant or have any glucose metabolism disorder‚ consult your physician before using this product. Great price, easy to swallow. Have to take 3 times a day. 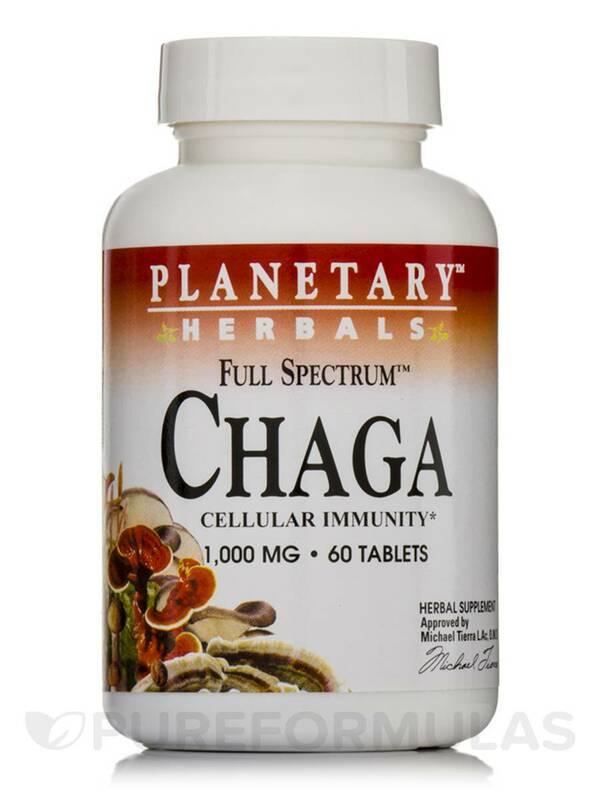 Full Spectrum Chaga 1000 mg by Planetary Herbals is great for immune boost. They Defintely have a ton of benefits.